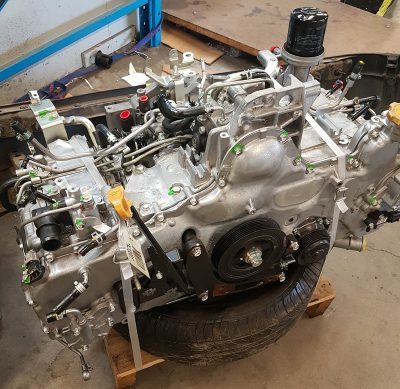 With our commitment to supplying the widest range of recycled Subaru spares we don’t just concentrate on the common or main stream parts, we make sure we cover as many model and Subaru parts options as we can..
One example of this is that we stock the Subaru EE20 common rail diesel turbo engine, these are not widely available in the New Zealand market but as there are some Subaru Forester and Outback diesel models in the country we felt it was only right that we stocked parts for them. We always try to have a few tested Subaru EE20 boxer diesel motors in stock at all times along with both the 6-speed manual gearboxes and the CVT auto transmission to suit. Not only do we stock these engines but we also have a range of used mechanical parts for them in stock, so if you need a pump, alternator or Subaru diesel starter motor we can probably help you right off the shelf! Strong for Subaru are the Subaru diesel turbo parts specialists!